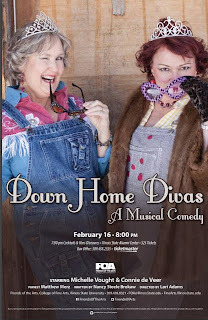 Have you heard about Down Home Divas? If not, you'd better get up to speed quickly, because word on the street is that this fundraiser for Illinois State University's Friends of the Arts scholarship program is almost sold out. I'm not kidding. There are only a few tickets left for the one and only performance on Saturday, February 16 at 8 pm. Down Home Divas will take place inside the ISU Alumni Center at 1101 N. Main Street in Normal. Tickets are $25 and you can purchase them throught Ticketmaster or at the Center for the Performing Arts box office at ISU. This down-home musical stars Connie de Veer, associate professor at Illinois State’s School of Theatre and Dance, and Michelle Vought, professor in ISU's School of Music, as old friends Deenie and Bee. The two were once roommates at Julliard, but life has taken them on different highways and byways since then. When they meet up again, their friendship -- and musical rivalry -- has become more a lot complicated. Down Home Divas is based on the book by local author Nancy Steele Brokaw, who has previously written the libretto for shows like the Holiday Spectacular, Tortoise and Hare's Big Race and Fertile Ground, an original opera commissioned for Prairie Fire Theatre. Brokaw teamed with director Lori Adams on those Holiday Spectaculars, and Adams will be at the helm of Down Home Divas, as well. Pianist Matthew Merz will provide accompaniment. Doors will open at 7 and a cash bar and hors d'oeuvres will be available at that time, with the performance beginning at 8. Wine and desserts will be served at tables during the show. For more information or to read more detailed bios of the performers and artists behind Down Home Divas, click here.